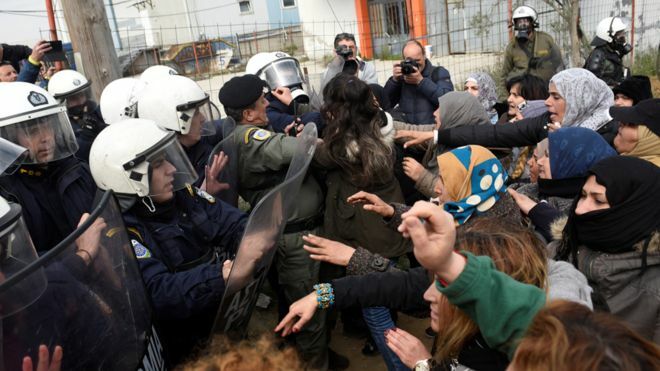 Greek police have scuffled with hundreds of migrants who gathered near the northern city of Thessaloniki hoping to enter North Macedonia, BBC reported. The trouble erupted at Diavata, a migrant camp, after a rumour spread on social media suggesting that a border crossing would be opened for migrants. The Greek newspaper Kathimerini says dozens of migrants are protesting on the tracks at Athens's Larissa station, forcing a suspension of rail services. Many are refugees from the Middle East. Reports say some migrants outside the official Diavata camp hurled sticks and stones at police, who responded with tear gas. Greek media describe as "fake news" the Facebook story about plans for an organised crossing of the North Macedonia border. About 600 spent the night camping in a field outside the Diavata camp, and there were more clashes in the morning as police blocked the route to the north. Speaking to the BBC by phone, a Kurdish migrant from Iraq, 25-year-old Bilal Jaf, said "the situation is tense in Diavata camp now - we're afraid that the police will try to evacuate our makeshift camp. "I live in Greece for 11 months, waiting my asylum request to be examined and I don't know for how long should I wait for that." Karzan Abdullah, 24, also an Iraqi Kurd, said: "I live in Greece for 12 months - I have to go on in Europe, because there is no life here anymore. "We are informed that the Greek-North Macedonian border will open today for us. My friends who also want to join the caravan are blocked by the police in Athens railway station." Tens of thousands of migrants remain in overcrowded camps in Greece, having arrived there in huge numbers in 2015-2016. They include many Afghans, Syrians and Iraqis. In that crisis Germany took in more than 800,000 asylum seekers - an issue that remains very controversial. International law grants a right of asylum for refugees fleeing war or persecution. The influx declined rapidly after Turkey reached a deal with the EU to intercept migrant boats and Balkan countries imposed tight border restrictions. In 2016, a sprawling tent city formed at Idomeni, on the Greece-North Macedonia border. It was later cleared by Greek police and the migrants were redistributed to various official camps.